Near a path over the brow of the hill between Gowlin and Lisdargan there is an underground passage called Staighre Chaitlín (Cathleen's Stairs) which leads to a cave. The tale is told of a local man who dreamed of a treasure on the Bridge of Limerick, went there and met a stranger who said that he had dreamed of treasure at a place unknown to him called Staighre Chaitlín; the local man who knew the place well returned home and found the treasure (Máire MacNeill, 'The Festival of Lughnasa', pp. 207-08). MacNeill also mentions several legends connected with the nearby hills to the east. Croaghskearda is the 269th highest place in Ireland. 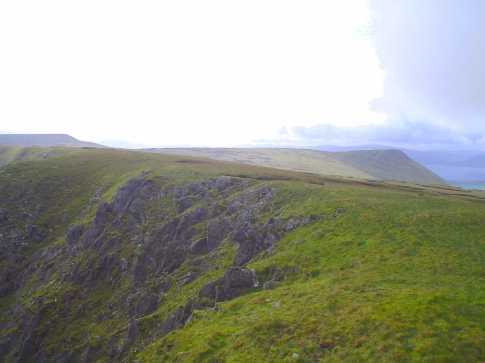 Croaghskearda was the third summit visited in a traverse over the mountains of Central Dingle.